DANA POINT — When OC Dana Point Harbor officials released their responses to public comments in a final draft of the harbor’s waterside redevelopment plan, local boaters balked at the short, one-week time frame they were given to review the document. As a result, locals have now been given more time to look over the contents of the 1,000-plus-page report. The proposed final Subsequent Environmental Impact Report (SEIR) covering the waterside redevelopment of Dana Point Harbor was released by the county — including its responses to public comments — Aug. 1. It was originally scheduled to be reviewed by the Orange County Planning Commission at an Aug. 8 meeting. The waterside improvement plan is part of Dana Point Harbor’s $140 million revitalization effort that aims to reconstruct and reconfigure the harbor’s aging docks and pilings in the east and west basins, upgrade waterside services and amenities, add 30,000 square feet of commercial retail space in the harbor and create new boat storage options for locals and visiting boaters. Local boating advocacy groups Dana Point Boaters Association and Boaters for Dana Point Harbor contacted Dana Point Harbor director Brad Gross, asking for more time to review the lengthy document prior to the Planning Commission’s review. The commission is tasked with giving a recommendation for or against the plan to the Orange County Board of Supervisors. “It’s more than 1,000 pages, and it isn’t easy to read,” said Boaters for Dana Point Harbor president Bruce Heyman. Dana Point Boaters Association director James Lenthall noted that the group had made several recommendations and comments to the Marine Improvement Plan, and wanted to have the chance to read over the county’s responses to those comments, as well. “We’re grateful to the Orange County Planning Commission for postponing the public hearing on the SEIR, to allow boaters more time to review the document’s 1,000-plus pages,” Lenthall said. At press time, no indication had yet been made on when the SEIR would be reviewed, but the Planning Commission’s next regularly scheduled meeting is Aug. 27. In the works since 2006, the SEIR for the waterside improvements at Dana Point Harbor has added some new twists to the project, with the county’s responses to comments potentially leading to a change in some controversial projects and a new alternative to the full marina redevelopment as it currently stands. First; according to the revised report, the proposed dock reconfiguration at OC Sailing and Events Center will be altered, removing the planned addition of docks adjacent to the harbor’s Baby Beach site. According to the original report, the project called for a dock expansion adjacent to Baby Beach that residents and beach-goers worried would encroach on the beach area and add boat congestion near the swimming area. After receiving more than 600 letters from the group Save Baby Beach, the harbor department has modified the plans to eliminate the dock extension near the beach. While the extension is slated to be removed, the department still plans on constructing a new dock at OC Sailing and Events Center, near the inner channel of the harbor to be utilized by boaters to access two new pumpout stations an ADA-accessible ramp for commercial charter passengers. In addition to the OC Sailing and Events Center changes, the project’s proposed alternative plan has been updated as well, to include a less-costly dock replacement plan dubbed the Revised Project Alternative. Proposed by board members of Dana Point Boaters Association, the alternative plan is aimed to revitalize and maintain the harbor’s 40-year-old docks and boater-serving amenities at less cost to the county, opting to only replace the docks in the east and west basins without realigning the docks in the west basin. Lenthall noted that in the nation’s current economy, and with the California Department of Boating and Waterways (Cal Boating) being taken over by the Department of Parks and Recreation in 2013, the project’s funding options are lessening, compared to earlier assessments. “The amount of money that was once on the table for us to complete this revitalization simply isn’t there anymore: Some of it’s been taken away,” Lenthall said. While the proposed alternative shows a possible new cost-based approach for the revamp of the harbor, OC Dana Point Harbor deputy director Lisa Smith said that funding discussions will come later. Gross said the delay in getting the Final SEIR to the Planning Commission will only delay the project’s completion timeline, which requires certification by the Board of Supervisors and the California Coastal Commission’s approval, to get a Coastal Development Permit for the project. Once approved, Smith said a construction timeline and a potential phased-in approach can be finalized, and will be discussed with the boating community as the final project designs are developed. 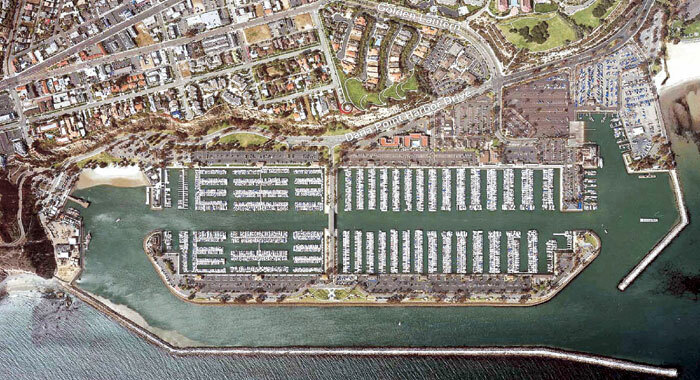 The recreational boater advocacy group Dana Point Boaters Association (DPBA) has voiced concerns about the OC Dana Point Harbor’s landside harbor revitalization plans that call for the development of a 65-foot-tall boat storage facility across from the harbor’s launch ramp. The issue comes following the release of consulting firm MVE Institutional’s analysis that looked at the pros and cons of the 50,000-square-foot enclosed boat storage facility and the 393,000-square-foot boat storage deck option. The analysis recommended that the county choose the boat storage building over the deck for the final plan, citing better operational efficiencies, preservation of harbor views and a cost savings in comparison to the storage deck option. But DPBA said its members believe the report missed some major issues in the harbor, chiefly pertaining to the plan’s practicality and affordability for trailerboaters in Dana Point Harbor. According to a DPBA statement, the boat storage barn as currently planned will not accommodate boats on trailers, as the boat barn will be capable of holding 400 boats on storage racks and placing them in the water via a gantry crane system, with only 93 mast-up boat storage spaces planned on the outside of the building. While the system could help ease launch ramp congestion, boaters using the storage facility will not have easy access to their boat trailers, making boat travel by land difficult. In contrast, the boat storage deck would be constructed to contain 327 trailerboat spaces on its top deck, along with 32 spots for small trailerable boats on the lower deck. An additional 134 dry boat storage spaces would be developed at ground level on the south side of the harbor’s Planning Area 1. “Most tenants of the current Embarcadero dry storage facility will be required to either discard their trailers or find separate off-site storage for their trailer at additional expense,” the DPBA statement read. “Further, at more than $30 million, the Dana Point Boaters Association questions the wisdom of such an exorbitant expense for dry boat storage when funding for the overall Dana Point Harbor revitalization project has diminished.